If Casey Neistat were to be flown with the human-flying drone in the United States, what licenses / permits would be required from the FAA to make it legal? All aircraft categories in the FAA assume that the pilot is inside the vehicle. Drones are operated remotely by an operator which is not carried in the vehicle, but drones are unmanned. 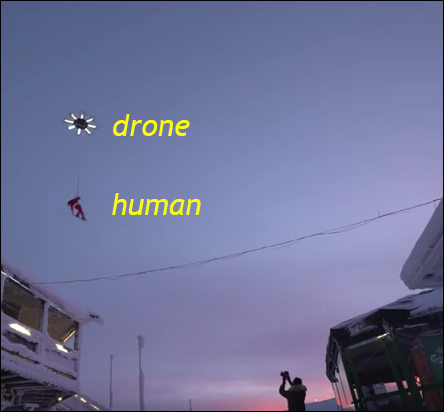 Is there a regulation for "drones which carry person(s) while operated remotely by an operator"? The Section 333 page has further links. Spot checking some of the approved exemptions shows that the exempted status tends to look quite a lot like the 14 CFR 107 (sUAS) rules and include phrases like "carrying no passengers or crew", "weighing less than 55 pounds including payload". Under this grant of exemption, a PIC must hold either an airline transport, commercial, private, recreational, or sport pilot certificate. The PIC must also hold a current FAA airman medical certificate or a valid U.S. driver’s license issued by a state, the District of Columbia, Puerto Rico, a territory, a possession, or the Federal government. The PIC must also meet the flight review requirements specified in 14 CFR §61.56 in an aircraft in which the PIC is rated on his or her pilot certificate. Must adhere to 14 CFR 107, treating the flight as an sUAS flight even though it exceeds the sUAS maximum weight. The PIC must be certificated for Remote Pilot (sUAS) or hold an airline transport or commercial certificate with a corresponding class 2 medical and valid government-issued photo ID. Not the answer you're looking for? Browse other questions tagged faa-regulations unmanned-aerial-vehicle or ask your own question. Can an Iranian citizen attain ATP in the United States? What FAA rules govern tethered, outdoor UAV flight? What restrictions are there for flying near urban areas in the United States? What are the rules in UK law on carrying dangerous goods on drones?